When you have a flat tire, you need to replace that with something. There are compact spare tires out there that are made to be a temporary solution and then there are full-size spare tires that you can put in place that will hold up well and be able to handle all kinds of situations. 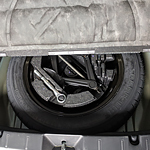 It is important for you to know that a compact spare is made to be used just to get you to a place where you can get a new tire put on. You need to be careful when using this type of a tire so that you do not overdo it and you do not drive too fast with it in place. A full-size spare will help you get further and can be treated differently. When you have tire service needs, contact Nelson Kia. We wish you and all of the other drivers in town safe travels.